One of the greatest mechanical engineers of his age, Donát Bánki was born in the small village of Bakonybánk on 6 June 1859. He was a professor of international fame at the Royal Joseph Technical University of Budapest and a corresponding member of the Hungarian Academy of Sciences. When Donát was about 8-9 years old, his father, district physician Ignác Bánki was transferred to the village of Lovászpatona in Veszprém County, where he devoted a lot of time to his children's education besides his medical work. Donát Bánki mastered some part of even the secondary school curriculum at the family residence, but in the end he completed his secondary studies in Budapest. Then he matriculated to the Faculty of Mechanical Engineering of the Technical University and graduated in 1880/81. He was only a fourth-year student when he won the first competition with his study on gas engines. He commenced engineering activities in industrializing Hungary after completing his tertiary studies. In the first year, he was employed as a designer at the Hungarian Royal State Railway Machine Works, then he worked for the Ganz and Co. Iron Casting and Machine Works for 17 years (including two years of designership at the Technical University). He started his career as a designer, becoming head of department and finally engineer-in-chief in the last 8 years. During this period, he contributed to the design of the Budapest corn elevator and Mechwart's plough, and he pursued considerable patent activities in the areas of gas engines and internal combustion engines. This was the period when his perhaps most well-known invention, the Bánki-Csonka carburettor was patented. In 1899, he was invited as professor to Department II of Mechanical Construction Engineering (Machine Elements and Hoisting Engines) of Joseph Technical University in Budapest, and in 1900 he took over the lead of Department III of Mechanical Construction Engineering (Hydraulics and Hydraulic Machinery) seceded from the former. In 1901, volumes I and II of his university lecture notes titled "Practical Hydraulics and Hydraulic Machinery" were published based on his lectures by Vilmos Misángyi and Miklós Hoffmann. In 1902, his front wheel drive automobile was completed, realizing his new idea, intended to eliminate the problems of rear wheel drives which were in general use at that time. For the automobile designed by him and manufactured at the Ganz Works, the engine, the gear shift, and the differential gear were built into a single block and mounted on the axis of the front wheels. After his study trip to the USA in 1908, he became interested in aviation. As he stressed in the 1913 volume of the official journal of the Hungarian Aviation Association titled "Mechanical Steering of Aeroplanes", "Air travel can only be safe if it can be steered by mechanical equipment..." In order to develop this, he designed and patented a hydraulic servo engine stabilizer in 1909. 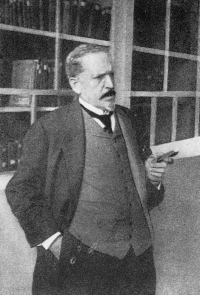 He was elected a corresponding member of the Hungarian Academy of Sciences and on 16 December 1912, he held his inaugural address titled "Fluid motion in bent conduits". In 1916, his book titled "Energy Transformations in Fluids" was published, becoming a basic design manual. The Engineering Association rewarded the work by a Cserháti Award and the Gold Medal of the Association. The book was also published in German at the Springer Publishing House in Berlin in 1922. After the turn of the century, there was considerable interest in the utilisation of hydraulic power, specially that of streams and rivers of small and medium fall. Bánki designed a simple and cheap turbine, presented in a manuscript titled "Neue Wasserturbine" in 1917, and in the Millers Journal in Hungarian in 1918. Outstanding in volume among the works of Donát Bánki is the design of Vaskapu hydro-electric power station. In addition to his remarkable machine design and patent-related activities, Donát Bánki was also highly devoted to professorship. It was a priority for him to assist his students preparations by lecture notes. During his professorship, he introduced laboratory training in engineering education. The oeuvre and works of Donát Bánki are greatly admired by posterity. The scientist died on 1 August 1922, leaving 136 foreign and domestic publications to posterity. His career can serve as an example for all engineers and members of the creative technical intelligentsia.